WATERLOO – Ann Walmsley is the winner of the 2016 Edna Staebler Award for Creative Non-Fiction for The Prison Book Club (Viking). 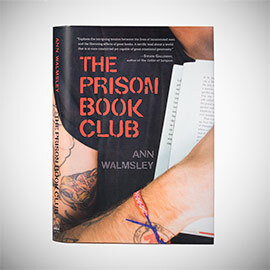 The Prison Book Club is a record of book club discussions, presented in a straightforward and engaging manner that draws the reader into the conversations and lives of the book club members, and, briefly, into Walmsley’s own journey to overcoming her initial fear of working with prison inmates. She concludes with short descriptions of the lives of a handful of book club members beyond their prison terms, leaving no doubt as to the profound impact that prison book clubs can have on those given the opportunity to take part in them. In addition to The Prison Book Club, the shortlist for the 2016 Edna Staebler Award included: That Lonely Section of Hell by Lorimer Shenher (Greystone) and The Right to be Cold by Sheila Watt-Cloutier (Allen Lane). Nov. 3, 7 p.m. to 9 p.m.: Renowned writer, editor and publisher Douglas Gibson will discuss creative non-fiction with past winners of the Edna Staebler Award for Creative Non-Fiction, including Wayson Choy and Lynn Thomson, at a public event at the Princess Twin Cinemas in Waterloo. Ticket information will be available in the near future on the Edna Staebler Award website. Nov. 4: Ann Walmsley be speaking to students, staff and faculty at a public event on Laurier’s Brantford campus. Details will be available shortly on the Edna Staebler Award website.